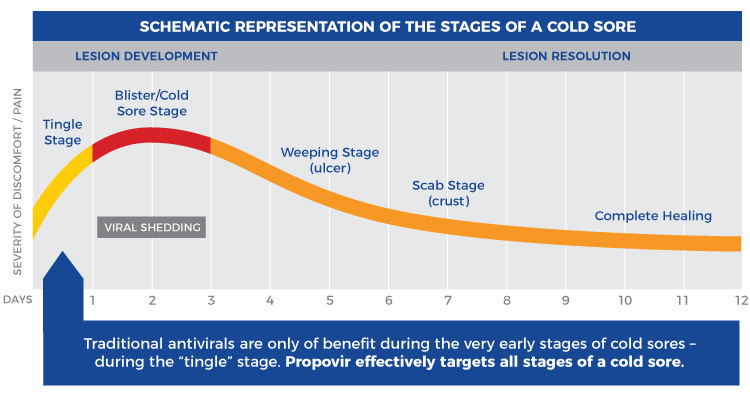 Conventional antivirals are only beneficial early on in the cold sore progression – during the “tingle” phase… Propovir is effective during any of the cold sore stages, from tingle or blister through to healing. 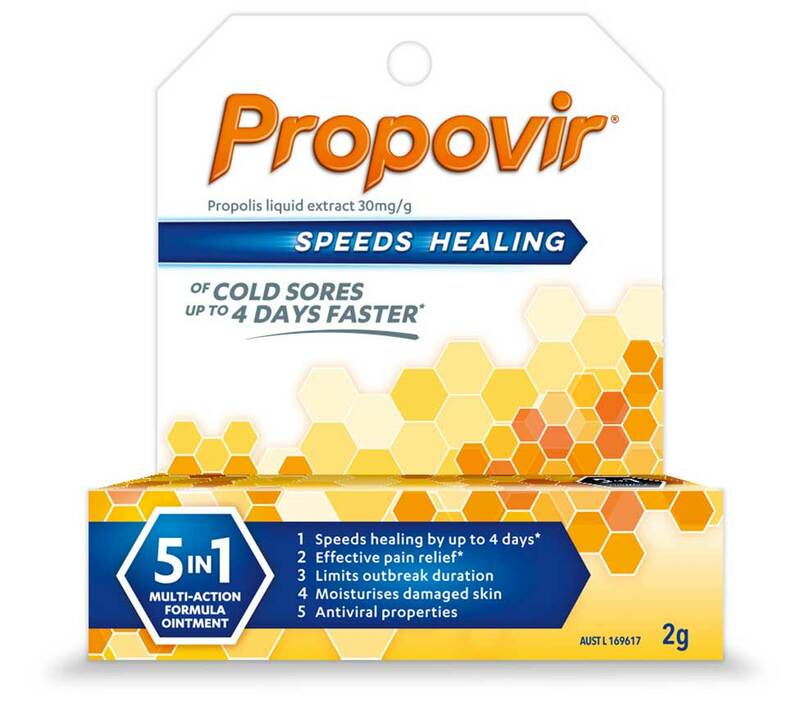 Propovir effectively targets all stages of the cold sore, from the initial tingle or blister right through to the healing stage. The time for the development of a cold sore is variable. The whole episode, from tingle stage to complete healing, usually lasts from 7 to 10 days. Cold sores are infectious from the time of the first tingle until the scab has dried. The virus is present in the blisters and in the fluid, and can spread. A tingling, burning or itchy sensation starts where the cold sore will later develop. These feelings are related to virus replication and are called prodromal symptoms. This stage can last for a few hours or for one day, before the following stage (blister stage) develops, with subsequent redness, inflammation, swelling and appearance of blisters. Start applying Propovir as soon as you experience any of these symptoms. The blister stage is characterised by fluid-filled lumps. The cold sore is now made up of a cluster of small blisters, full of white-yellowish fluid and surrounded by a red halo. Blisters are painful and can make eating or talking uncomfortable. The blisters then typically collapse and turn into weepy sores (ulcers) which then join up to form one large, weeping sore. The fluid in the ulcer is infested with newly born cold sore viruses. This fluid can effortlessly spread the lip blister virus to a different part of the body or to another person – either via touching someone else or sharing things such as towels, cups or telephones. The ulcer is also usually surrounded by a red inflamed halo. When the ulcers start to dry up, the healing process begins and a crust (or scab) forms. The crust will fall off when healing is complete. If picked, the scab will painfully crack and bleed. It is important to keep the scab moisturised to prevent cracks from appearing. The healing stage is the final stage in the life cycle of cold sores. After the crust falls off, some redness may persist for a few days. Ultimately the skin will return to its normal appearance at the conclusion of the cold sore cycle.